I am Andrea, or as my friends call me, Jinx. A foodie travelling around trying new places and cooking at home. I used to be stationed in Oslo for the past 4 years but I am now living in Berlin. I can't wait to start exploring this a city full with multi culty, delicacy and specialty shops. The city also has a vibrant restaurant scene with chefs who create interesting culinary concepts. With this blog I want to expand people's food universe and increase the enthusiasm and dedication for making good food. I will find and show you where you can enjoy the best meals in town, and how you can bring the restaurant into your own kitchen and be creative when cooking. I share everything we do related to food; recipes for healthy food as well as gourmet dishes, dinner parties I host for friends, restaurant visits as well as other food events I take part in. 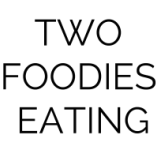 Why "Two Foodies Eating"? Because where there is one Foodie, there is always another one that will join. If you are in town, feel free to contact me and lets go and try out a new restaurant, café or anything that involves food.